My last visit to Sketch was at the end of a long, work-related evening with American business clients; I could only conjure up a vague memory of vast pink rooms as big as ballrooms and odd loos – something about pods? I was obviously more sober than I thought as, even without the haze of a dinner’s worth of red wine and postprandial sharpeners, the place is like stepping into an indulgent and light-hearted dream. 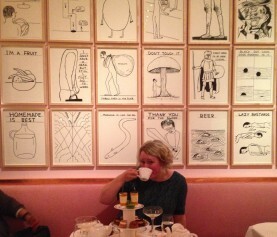 My friend Jenny Bloomfield and I had gone on a Bloomfield & Rolfe outing to enjoy afternoon tea amongst the wallpaper of David Shrigley artworks. Shrigley’s witty, naively executed, monochrome snapshots of quirk were the perfect accompaniment to a splendid tea; miniature, delicious lemon éclairs, choux buns bursting with jam and lightest whipped cream, a small pear tart – it’s pastry case crispy and buttery and divine; juicy passion fruit cheesecake in tiny glasses, a slice of chocolate orange heaven, and the sandwiches – perfectly formed smoked salmon triangles on spongy, quilted bread, rectangles of decorated cucumber fingers and the toasted slice of cheese croquet monsieur, wrapped in wax paper. And the best bit? They’ll bring you more for free – it’s the high class equivalent of the student ‘all you can eat’, although sadly that didn’t extend to the crisp, dry sparkles we ordered on the side, just to be indulgent. The setting is spectacular, deco indulgence on a grand scale; curvy pink chairs in panelled velvet cradle you like a flower head and the multi-hued chevron floor (courtesy of fellow YBA Martin Creed) offsets the pink perfectly meaning more graphic glamour than sickly rose-hued overload. 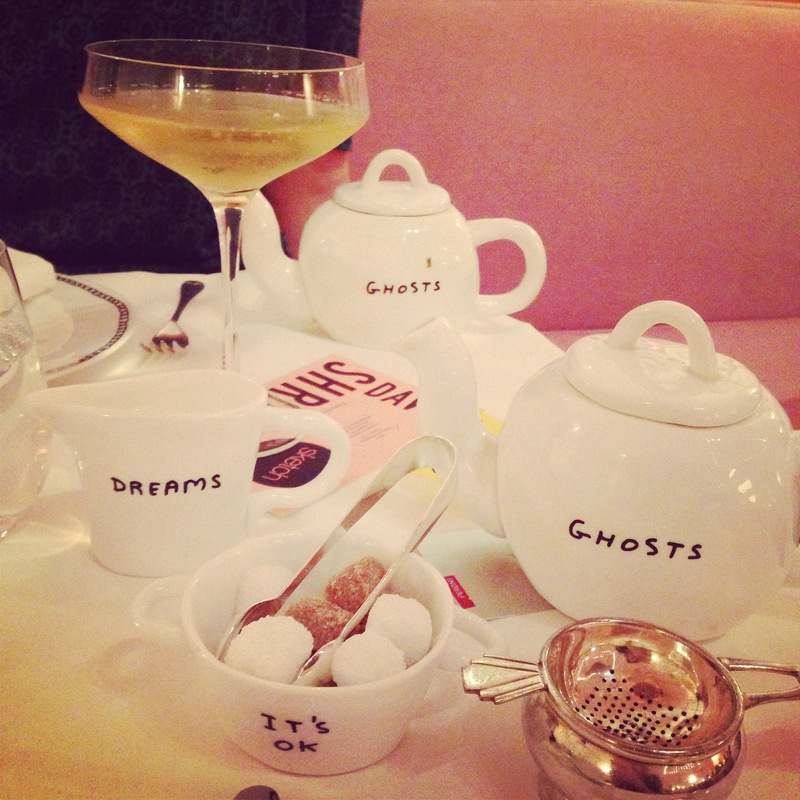 A London-based artist and illustrator. Please take a look at my portfolio or contact me for more information.